There are no suburban and commuter passenger train/rail services within Christchurch or in the greater Christchurch region. There are no Christchurch to Dunedin, Christchurch to Invercargill, Christchurch to Nelson, Christchurch to Mt Cook or Christchurch to Queenstown passenger train/ rail services, except for the combined train and bus travel services from Christchurch to Nelson, Westport, Hokitika, Franz Josef, Fox Glacier, Wanaka and Queenstown. 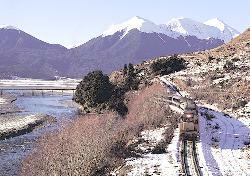 The TranzAlpine carriages are centrally heated in winter and air conditioned in summer, with forward facing seats with head rest or 'Table Group' (4 people around a table) seating. Both styles allow you to experience the amazing views through large panoramic windows, while enjoying the company of other passengers on-board. The TranzAlpine train has an open air viewing carriage allows you to get even closer to the stunning scenery and provides many opportunities to photograph your favourite spots plus a Buffet Carriage offering a range of hot/cold drinks, snacks and light meals on route. There are connecting bus and coach services at Greymouth to Fox Glacier, Franz Josef, Punakaiki, Westport and Nelson. All carriages are centrally heated/air conditioned, with forward facing seats with head rest or 'Table Group' (4 people around a table) seating that allow you to experience the amazing views through large panoramic windows.